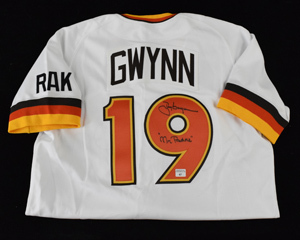 *Limited Edition Tony Gwynn Signed M&N Jersey Inscribed "Mr. Padre"
> *Limited Edition Tony Gwynn Signed M&N Jersey Inscribed "Mr. Padre"
Tony Gwynn Signed Mitchell & Ness Cooperstown Collection 1984 Style Jersey Inscribed "Mr. Padre" (size 48). "RAK" on sleeve. Limited edition sticker states that it is number 47 out of 100. Includes photo of Gwynn from signing and COA from Hunt Auctions.